We provide quality parts and laptop repairs in Brisbane. We specialize in not only laptop screen repairs but also any hardware repairs. We can arrange pickup and delivery. We repair any brand of laptop and can assist with any of the repairs below. Most repairs are repaired within 1-2 days. (Parts dependent) loan laptops available on a small charge. We have 16 years’ experience and a fully equipped workshop to make any trouble-shooting, cost effective and timely. We replace and repair damaged laptop screens, all brands, makes and models. Most broken Laptop screens are repaired within 24 hours, all notebook screens are tested and guaranteed for no dead pixels, line faults or contract issues and are backed by 12 month warranty. Your laptop keyboard can fail due to wear and tear or something being spilt on it… which is most common. 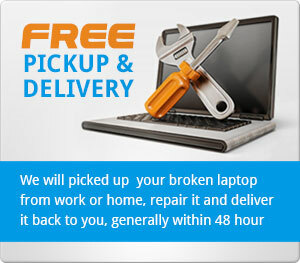 We will replace your broken laptop keyboard in generally 24 hours. Yes, this can be fixed, due to the design of the charging plug (sticks out) it’s common for the charging plug to put pressure on the internal charging socket (caused by charging whilst on your bed, on your lap or any other soft surface) combine this with the heat generated from charging, can cause a break where the internal charging socket connects to the mainboard thus giving you intermittent charging. So, if you have to position the charging plug in a particular way for you notebook starts charging, you can be pretty confident, this is the problem. The answer here is act fast, depending on the type of liquid it is important to firstly remove any power and the battery, as this speeds up the corrosion process. Your laptop will be completely disassembled and any moisture removed. The component will then be washed down with a special solution to remove any residual impurities, from what was spilt; sugar, salt, etc. The Laptop will then have a full hardware service only then can we assess the laptop to identify any further damage, the chance of the unit being fixed after performing this treatment is quite high. Much like a car most PC’s and laptop’s require periodic hardware servicing. Due to the increased capability of laptops these days, they produce a lot of heat, to disperse the heat additional cooling fans draw air through the machine which in turn also draws in dust. Dust build up will block vents, fans, cooling systems and heat sinks. Dust – the laptop needs to be disassembled and any dust needs to be vacuumed out rather than blown out. If the laptop is blown out the dust will embed itself in the numerous small ports, sockets and mechanism which can contribute to ongoing issues. The cooling system – The processor, video cards and heat sinks will be cleaned and new thermal paste applied to ensure that the heat is transferred into the cooling system properly. Alignment – this is a crucial part, upon reassembly the unit cannot just be just screwed together, due to the number of small mainboards, sockets, ribbon cables and ports the machine needs to have even pressure applied to all screws to allow correct alignment of all components of the laptop, only then can each component be tested on its own integrity. Testing – Once the machine is re-assembled each component hard disc, video card, memory, processor can be tested for performance and reliability. So if any of the above problems arise … it may just be a hardware service.